Going to the beach! I love the ocean and all the animals that live in it. Towards the end of summer Sammie attended a local VBS (vacation Bible School) where she heard about the idea of the buddy bench. In her words “If someone is lonely they can go sit on the bench and others know to go up and ask them to play” She doesn’t want anyone to feel alone and at times would have used it herself. Also a place for new kids to sit and those feeling left out or wanting to make a new friend. She came home that evening and told me her school needed a buddy bench! She made an appointment with the principal to ask if they could get one. I had heard of a company in Evansville that turned recycled plastic caps and lids into benches. I told Sammie about it and we decided that would be a great way to get the community involved, we could recycle and would also cost a lot less than a new bench. (new bench $900. Recycled bench $250) When she met with the principle with her idea and how to get it he was excited about it and approved her initiative. 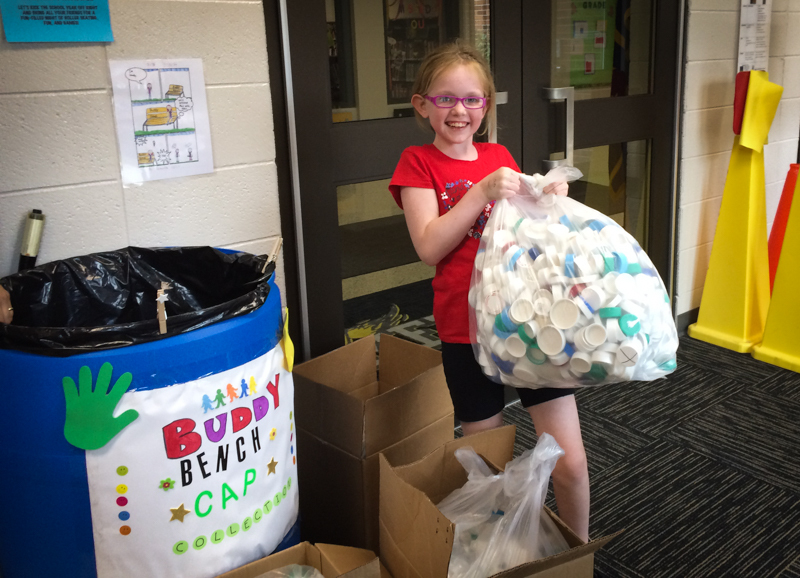 Sammie made a comic explaining the buddy bench and I posted on facebook a video of Sammie talking about wanting a buddy bench for her school and asking others to help her save plastic caps and lids. It got shared a lot! I also created a page for people to follow along on the journey. Sammie talked to the PTA, the student body to get them excited about the project. Her dream was a 6ft bench with back for each of the two playgrounds. We were hoping to get 1 in a year. ( 400 lbs of plastic caps and lids which equals about 10 (55 gal drums) full for 1 bench. She also went and asked local pharmacies and businesses to help her save caps. The ball team here the Tincaps even made announcements at a few of their games! Vera Bradley helped collect as well. We were contacted by a news channel that ended up doing 3 segments on the project and the paper covered it a few different times. Each time more connections were made! I had people contacting me saying they were bullied as a kid and loved this idea and others that heard Sammie’s sweet voice talking about it and had bags of caps they had saved and wanted to donate to her project! Also many people saying they have been saving caps but didn’t know what to do with them since they can’t be recycled. On the facebook page Sammie would do Live Cap Talks talking about what was going on and other fun plastic tidbits! At Fort 4 Fitness ( a big marathon here in town) We got to collect caps at the finish line! Sammie was leading and involved in whole process from initiating it to collecting caps to sorting and then making the long trip to pick up the benches! For an 8 year old who just turned 9 I am so proud and impressed with how she has handled everything with humble grace! Another fun thing is that we did was get a cap sent from all 50 states!! We have also received caps from Africa, Israel, Germany, New Zealand and Mexico !! She got many wonderful letters from people that loved what she was doing! Even letters from a family in Alaska! Within 2 months we received over 1,200 lbs of caps!!!!! By the time we brought the caps down to company to pick up our benches we had collected over 1,600 lbs! We were able to get 3 benches for the school as well as help out 3 other area schools wanting to get buddy benches at their schools after hearing about Sammie’s project!! Since then a school up north collected for their school after hearing about what Sammie did and we have 11 more schools nearby currently collecting for Buddy Benches in Indiana and have been contacted by almost every state interested in doing this along with many countries!! 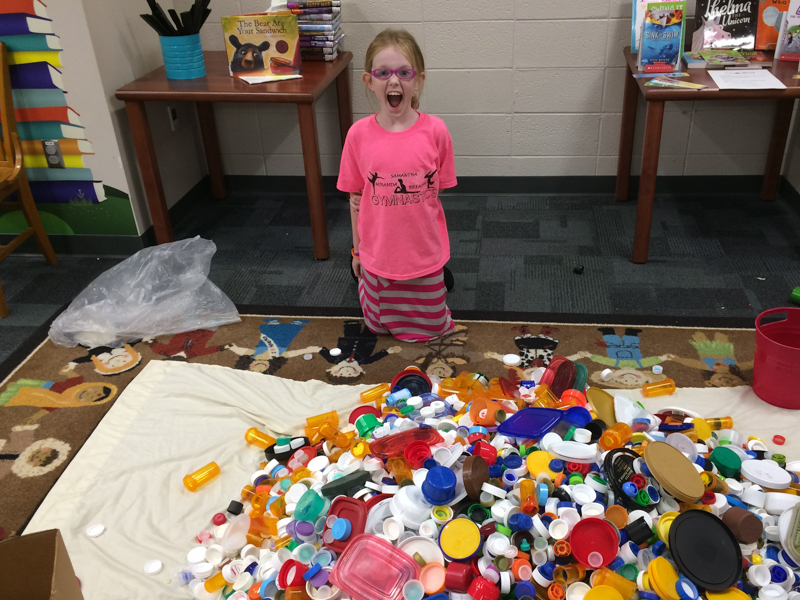 A place in India was inspired by her story and had a plastic cap clean up day around one of their lakes and collected over 500 caps in an hour. 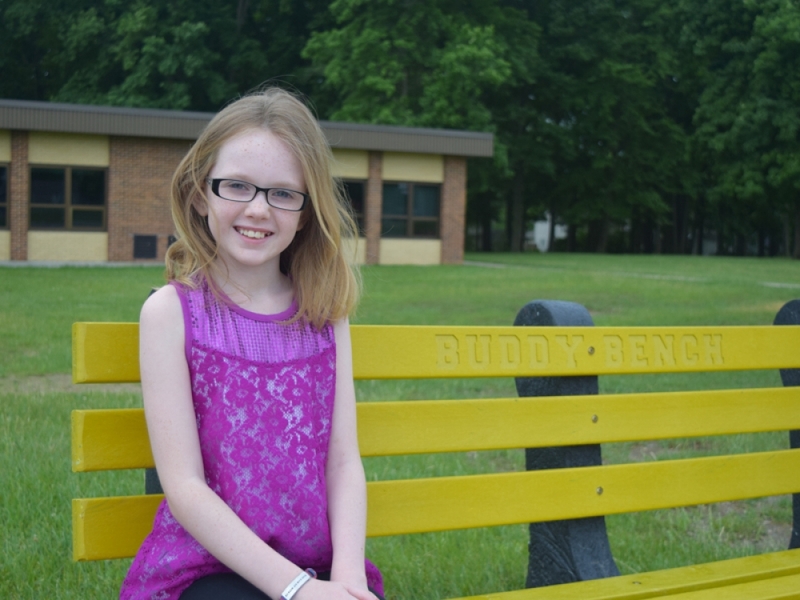 Sammie would love to see Buddy Benches on every playground! We are so grateful for all the support! The benches are now on the playground being used to help no one feel lonely! 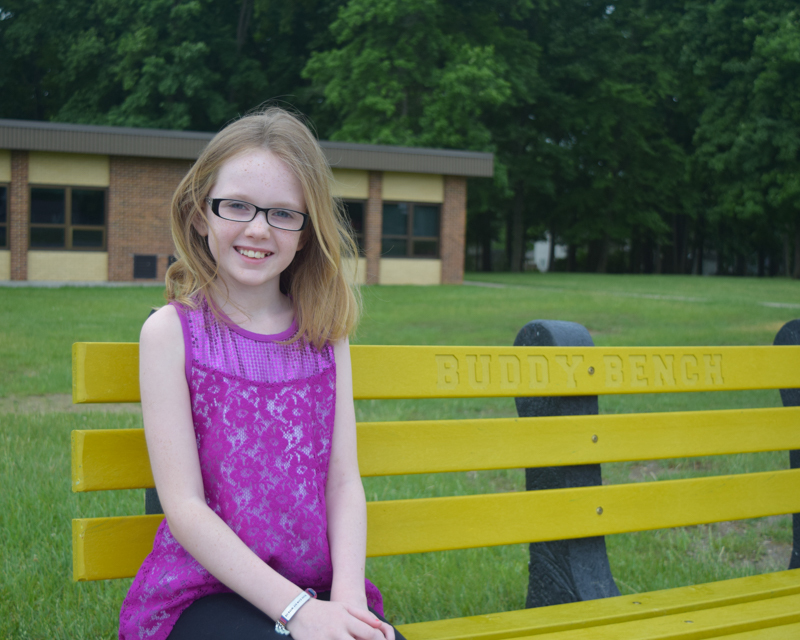 One of the benches is engraved “Sammie’s Buddy Bench” which was a surprise to Sammie! The Mayor came to see the benches and gave her a Certificate of Excellence! We love seeing the idea spread! 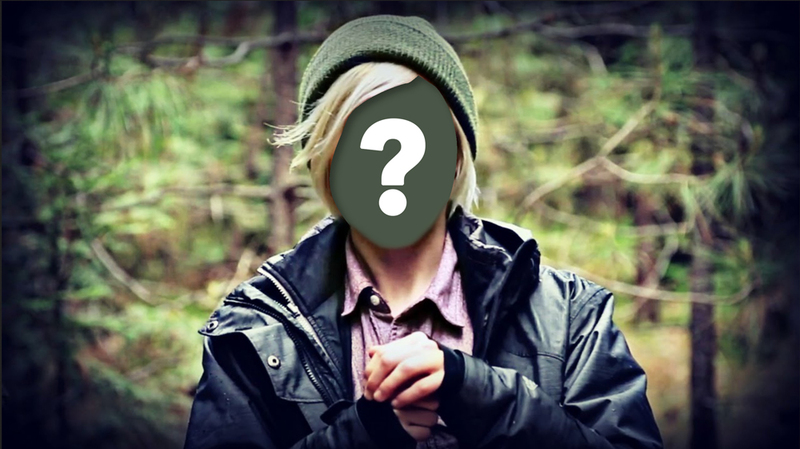 Sammie was featured in a few videos on facebook and Youtube that have gone viral with over 25 million views combined. Reece Witherspoon has tweeted about it along with a story in USA Today, Martha Stewart Living, Babble, Upworthy, Norwex and her Her View From Home. 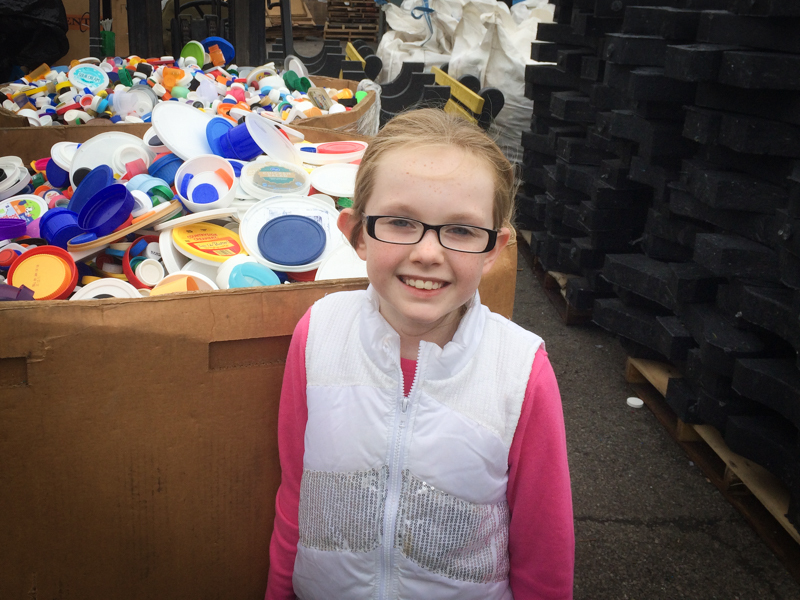 Her story has reached all over the world and touches the hearts of those lonely, those recycling, those wanting to make the world a better place. It is a win win project. She was recently featured on The Today Show with Kathy Lee Gifford on the “Everyone Has a Story” Segment. 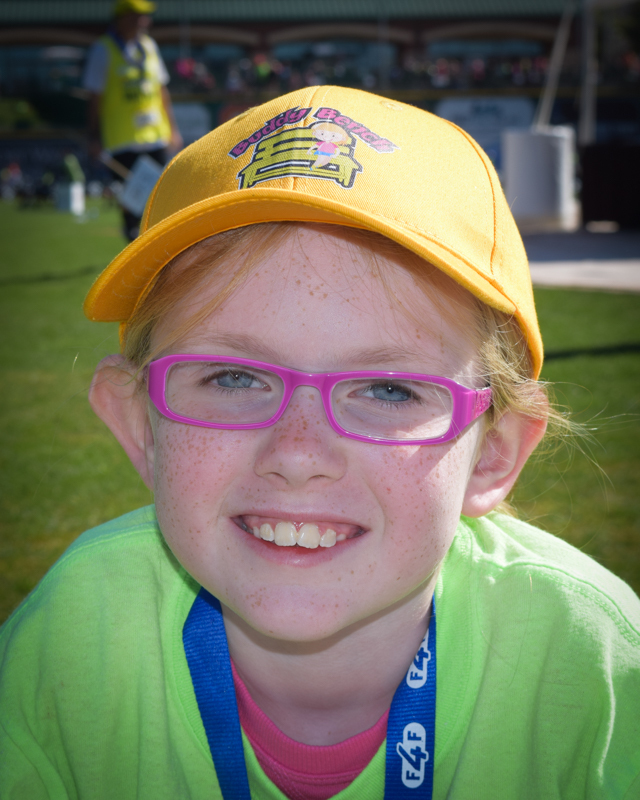 | Sammie, rocking the official Buddy Bench cap. | Sorting bottle caps is no small task. It ain’t easy being green. | Once they’re sorted, Sammie can drop caps off to turn them into benches. 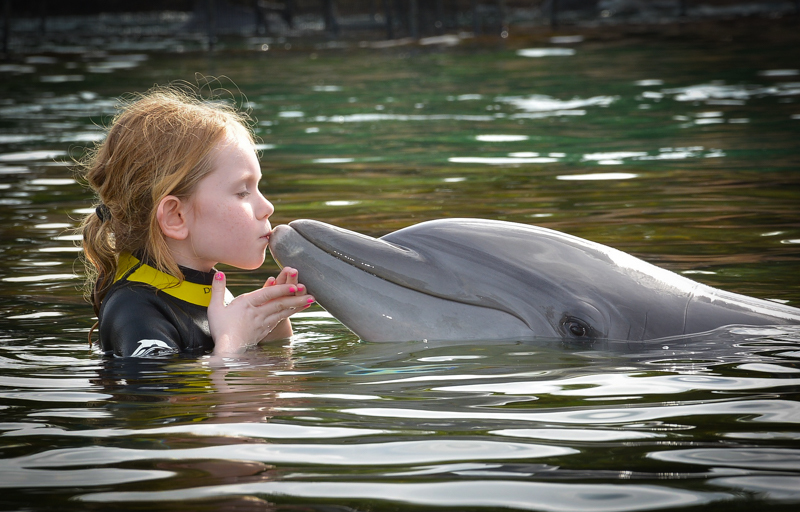 | With her favorite animal, the dolphin. Be Kind and recycling is so easy and good for the earth. Beautiful things can be made out of recycling caps that can help people like Buddy Benches.